Pupils at Hawthorn Primary School in Elswick, Newcastle-upon-Tyne received a surprise visit from Sting today, joining Kathryn Tickell. Their visit was in support of the In Harmony project; a project delivered by The Sage Gateshead at Hawthorn Primary School. The project has enabled every child in the school access to a musical instrument and music tutors on a daily basis as part of a national programme that aims to inspire and transform the lives of children in deprived communities within the UK, using the power and disciplines of music-making. Sting joined the pupils along with award-winning Northumbrian piper and composer, Kathryn Tickell and singer Mike Tickell, to listen to the pupils play instruments they have received since the project started. Sting said: "I wish I’d gone to Hawthorn School, as I’d be a better musician today. I’m delighted to be here to see the results of this excellent music programme." Kathryn and her Dad, Mike, also performed in the school’s assembly and demonstrated how the Northumbrian pipes worked and together with the children, they sang traditional Geordie songs including ‘The Blaydon Races’. Kathryn Tickell said: "It was great to be at Hawthorn School today. There is so much energy and enthusiasm from the children and staff in the school. They obviously love playing music and it’s amazing how far they’ve progressed in such a short time. There are a few stars in the making there! Funding for the In Harmony project came from Arts Council England and the Department for Education. Within this grant, money was allocated to fund a temporary basic portacabin to be built providing an extra learning room for the project. Since then, Sting, along with playwright, Lee Hall, have together made a significant further contribution to provide an even more inviting space for the young people to learn in, one of which is a permanent structure using cedar cladding that will give a lasting legacy for the pupils of Hawthorn Primary School. Judy Cowgill, Headteacher at Hawthorn Primary School said: "We were delighted to have the chance to say thank you to Sting for his contribution to our music cabin. We couldn’t manage without it and it has very quickly become the most important room in the school. I hope he was as amazed as we are at the progress the children have made in the last few months. They are on their way to becoming real musicians." Wendy Smith, Head of Strategy and Enterprise at The Sage Gateshead added: "Sting’s visit to Hawthorn Primary School today was a fantastic boost for the children, families and staff. Everyone was delighted to have the opportunity to thank Sting for his support for In Harmony Newcastle Gateshead. It was an inspiring morning of North East music with performances from Kathryn Tickell and her dad Mike Tickell as well as the newly formed Hawthorn School orchestral ensembles." Based on the principles of Venezuela’s inspirational El Sistema, the In Harmony project not only develops musical skills but also aims to improve children’s way of life. Regular music lessons delivered in the school and nursery by musicians from The Sage Gateshead and the Newcastle and Northumberland Music Education Hub will help develop learning, self-confidence and self-esteem, social skills, wellbeing and health. I love the story, but look at Sting in the picture. He is truly happy to be there with those kids. Do you think I could get him to come give a lecture to my college students about the role of music in the development of intellect? We're asking you, our members, to cast your vote for one of the below designs. There are 2 design options available with a color variation offered for each shirt. We are showing each in men's and women's fitted styles. 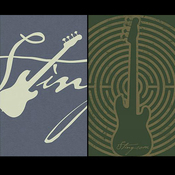 The design with the most votes will become the official Sting.com 2013 members shirt! You will be able to select your shirt type (men's or women's fitted) once the winning design is chosen.